The Cincinnati RPAC (REALTORS® Political Action Committee) Trustees and the CABR Board of Directors has voted unanimously to endorse Mayor John Cranley for re-election as Mayor of Cincinnati. On Friday September 8th, both Mayor Cranley and his opponent each interviewed with the Cincinnati RPAC Trustees for 1 hour. Please vote for Mayor John Cranley on November 7th! 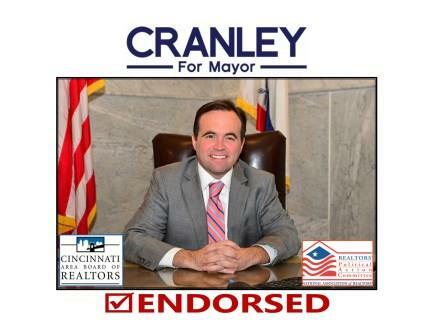 And encourage your family, friends and clients to vote for Mayor Cranley too! If you know of locations where Mayor Cranley yard signs can be placed, please email those addresses to Mark Quarry at mquarry@cabr.org.